When it comes to oil boiler servicing in Dublin your team of fully qualified oil boiler engineers at plumber in Dublin can help. As our business has been operating for over thirty years with a reputation second to none we have the knowledge to deal with all oil boilers. If you oil boiler breaks down we can repair it. If it's oil boiler servicing you require we can oblige. If you need a professional oil boiler installation just call us. What are the benefits of oil boiler servicing? Better performance. 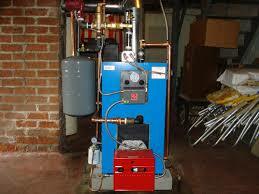 A regular oil boiler service will improve the performance of your boiler. This can then save up to 15% on your yearly heating bill depending on how long since your last service. Identifying faults early. Your boiler engineer can notice early signs of parts that are starting to fail. Nipping a problem in the bud will save expensive repairs and inconvenience further down the line. Health and safety. Boilers can be dangerous if not cared for properly. If they develop leaks it can be the "silent killer", Carbon Monoxide. This clear odorless gas can cause illness and even prove fatal in serious cases. A water leak on the other hand can cause damage to the structure of the property. An even worse scenario is if it comes in to contact with electricity, this can then become a fire hazard. These are a few of the reasons you shouldn't forget about oil boiler servicing. At plumbers in Dublin our staff are all fully qualified and R.G.I.I. registered. We have many years experience in servicing oil boilers and our prices are very reasonable. They range between €59-€89 ex V.A.T. depending on the make and model. If you would like to book your annual oil boiler service at a time that suits you (weekends and evenings available at no extra charge). Call your local team today on 01-2603222.